Well, the front made it through. It’s not a strong front, and it won’t last too long, but at least it should clear out our weather for a day or a bit longer. I guess we’ll have to take what we can get after such a soggy September. This should be a pretty nice day, with highs only in the low- to mid-80s, albeit with partly to mostly cloudy skies. Light northerly winds will bring some drier air into the region as well, and this should keep rain showers mostly at bay—although we can’t rule out some lingering activity along the coast. 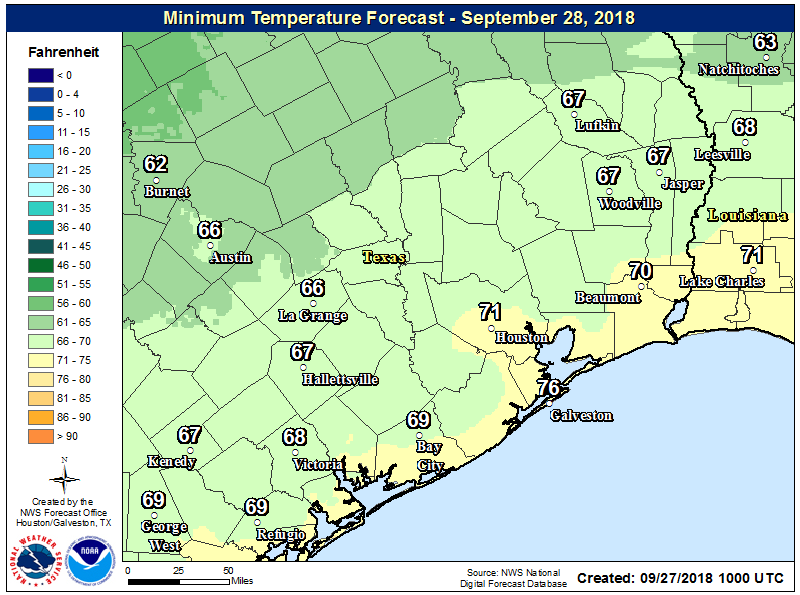 Low temperatures tonight will probably be the coldest they’ve been this fall, with the northern half of Houston likely falling just below 70 degrees. Again, this isn’t a particularly strong front for late September, but this evening will probably feel pretty nice outside. After the cooler start, the region will see the return of moisture from the Gulf of Mexico on Friday, and this should allow some showers and thunderstorms to start spreading into coastal areas, and possibly inland later in the day. With partly sunny skies and highs in the mid-80s, we don’t expect anything too widespread or too heavy in terms of rainfall. The weekend, unfortunately, looks like a hot mess. With the cold front moving back onshore as a warm front, plenty of moisture, and a favorable upper atmosphere pattern, we’re likely to see fairly widespread showers on both Saturday (almost certainly) and Sunday (probably). We don’t anticipate flooding concerns—the heaviest rain is likely along the hard-hit coast, but even there amounts probably will be 2 inches or less for most—but it should be another muggy, cloudy, and warm weekend with highs in the mid-80s and overnight lows only dropping to the mid-70s. Blah. Monday will probably bring more of the same before high pressure builds over the region. This should be enough to knock rain chances down to the 20 to 30 percent range by Tuesday for most of next week. Highs will creep back up into the upper-80s, and we might actually see some sunshine by Wednesday or so. The region’s first “strong” fall front remains frustratingly at least eight to 10 days away, if not more. For that reason we suggest you enjoy today and tonight, with its almost fall-like weather, and brief though it may be. A faux Fall day – I’ll take it. I have read chatter about the long range outlook of something developing in the Gulf.. A Central American Gyre ( energy pulling up from the Pacific) merges with leftovers from Kirk in the Western Caribbean to produce a monster of a storm afftecting the Western/ Northwestern Gulf..For the second week of October, thereabouts ..Is there any credibility to this, or am I looking at hyped up nonsense designed to make people click on the person’s website? Grrrrr…. At this point I think you’re actively looking for something to be concerned about. I wouldn’t be, at least in regard to Texas. Eric, I think they’ve seen the CMC ensembles, which does indicate it coming to Texas coast at or around the 240 mark (10 days). Please help everyone understand why you are not concerned despite this model. This model is notorious for spinning up tropical storms frequently that end up being false alarms. 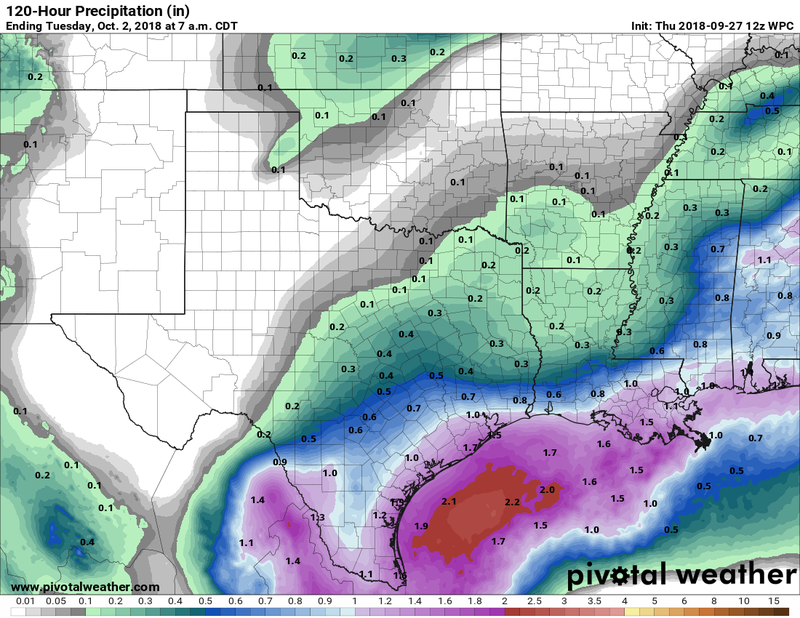 There’s little to no support from reliable modeling of a credible Northwest Gulf threat. Often, this time of year, you see tropical systems spin up on models on day 10+ and as time goes on, they never advance forward in the forecast. In other words, they’re perpetually day 10+ storms. Even if something does spin up, with a trough digging into at least North Texas next weekend, it would likely be enough to deflect any tropics stuff to our east. Anyone selling tropics gloom and doom right now is purely looking for eyeballs. This weekend is opening weekend for The Texas Renaissance Festival… I see 50% chance of rain on the muggle weather sites, but do you expect there will be lots of rain Saturday and Sunday out that way (Todd Mission, near Magnolia)? Or will it just be intermittent? go anyway! TRF is more fun in the rain. Seems like every time we have a front a week or two away, it rarely ever pans out, and I recall that happening a lot last fall as well. I know long range forecasts are sketchy, but it just seems odd that it always comes up short. I would think it would hold true 50% of the time. I actually went out for a run at 11am today and it wasn’t disgusting, awful, or gross. I’d forgotten what this was like!